It's week 2 of The Cat's Pajamas Tuesday challenge of Bright Colors! You still have another week to play and link up your creation for a chance to win. For my card this week, I created one using the set of Friendship. This image from the set makes me giggle and the sentiment to go along with it is perfect. I think we all have those friends that make us laugh and you can act goofy around. I used some patterned paper from MME and layered the image over the TCP Grapevine Wreath die cut out. The corner of the patterned paper was folded down and a button was added. The first word of the sentiment was stamped at the top while the remainder directly over the pattern paper. I was not totally happy with the turn out of the sentiment over the pattern paper, but it was done and for the most part, I think you can see and read it. The card was finished with some rhinestones and my white gel pen accenting the top sentiment. Thanks so much for stopping by and we hope to see your fabulous creation linked up on the TCP Blog! Today is Feature Day with Your Next Stamp's DT and it's all about flowers. The team has put together a fabulous collection of all things flowers and you won't be disappointed. For my card, I couldn't resist using the Mini Flower Splatter stamp to create this simple and fun card. Today is Karen's sons birthday! Happy birthday Brandon! 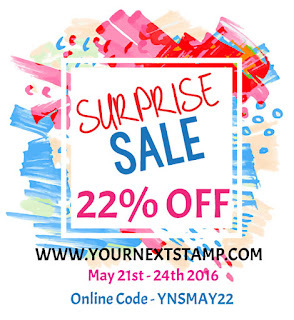 To celebrate, Karen is adding a surprise sale for you to enjoy. Happy shopping! It is another Friday challenge over at Your Next Stamp and today, I am using the colors to play along. Using the newly released set of Keepin' It Reel, I wanted to make this fun underwater scene using the fish and octopus in the set. The "water" was started using some dp from MFT. I then used some of my distress inks and stains to go over the bottom of the dp to make it a bit darker. To make the top of the water, I used the YNS Cloud Border die to create the look of waves. The images were stamped, colored with Copics, and cut out using the coordinating dies to be popped up in the water. The sun is from the Rainbow Fun die set and was also popped up before the sentiment was stamped directly onto the card base. The scene was completed with some Glossy Accents for the eyes and fun Ice Ice Baby gumdrops for the bubbles. We sure hope you come and play along with us for your chance to win! Just be sure to link up on the YNS Challenge Blog. Thanks so much for stopping by! Today is a another fun TCPTUES challenge that I think is one so super fun. I love sentiments and cards that sometimes only feature that. Words can be so powerful that all you need is that and no pictures. Well, this challenge focuses on just that. Sentiments! I am using the new sentiment die of 'Sending' along with the set of Words of Love to created this CAS waterfall type of words on this card. 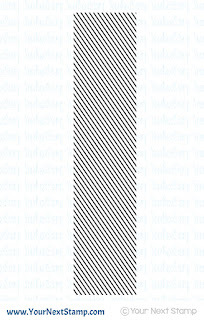 I cut out 'sending' three times to stack on one another for some dimension. Using different Memento colors, I stamped 'Hugs & Kisses' down one side before adding the sending to the center. The card was finished with a few sequins and accents from the Words of Love set. Don't forget that there is still time to join in on the Spring Blog Hop for your chance to win a $50 gift certificate to the TCP Store!! You have until May 26 to link up and you can enter as many times as you like! Winner announced May 28. Thanks so much for stopping by and we hope to see your creations! Head over to the YNS Blog today to see a little throwback Thursday spotlight on me. Over the course of the few weeks, YNS is featuring a throwback Thursday on each DT member. Come check it out! Today is a new YNS Challenge for you to partake in. The sketch is a super fun one and the colors if you choose to use instead, are perfect Spring colors! 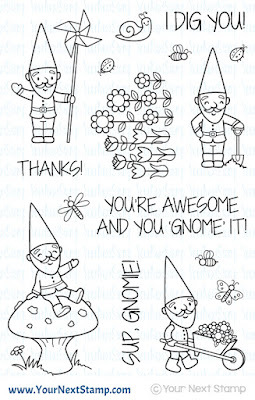 For my card, I am using the newly released set of Cute Gnomies along with the sketch. These guys are so cute and I couldn't resist inking them up again for this weeks challenge. 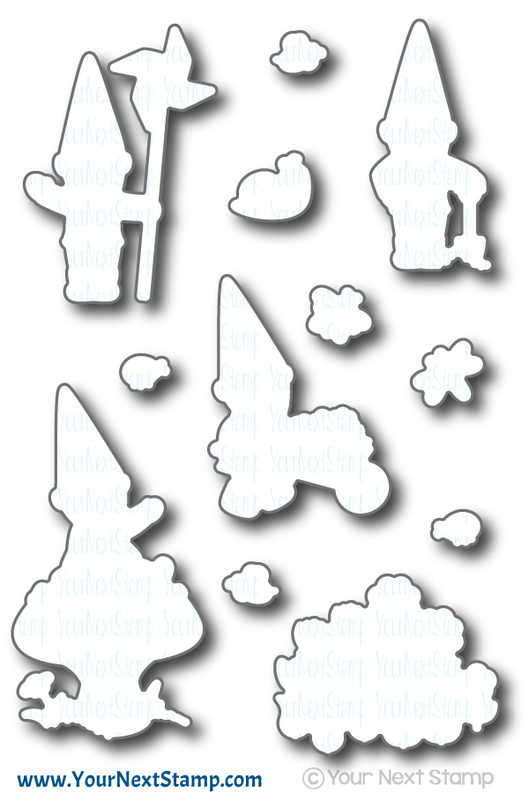 For the patterned paper, I used some from Studio G in my stash before layering a circle cut out from the Circle Stitching and Piercing die set to pop the cut out of the gnome on top. 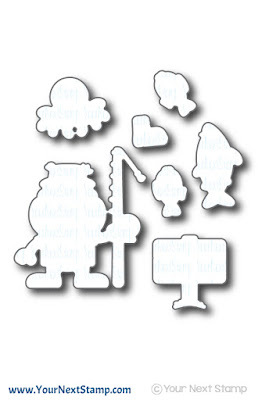 The gnome was cut out using the coordinating die set as well as the butterfly and bee. All images were colored with Copics. The card was complete by adding the sentiment, new Pastel Magical gumdrops, and some white stitching made with my white gel pen. Be sure to stop by the YNS Blog to see all the fab creations the DT has made with this challenge. Also be sure to play along and link up for your chance to win! Thanks for stopping by and have a great weekend!! 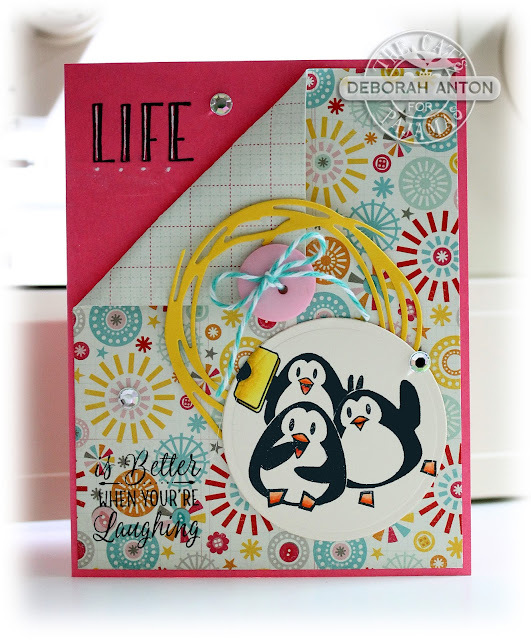 It's DT time with Your Next Stamp and this month's theme is all about stripes! 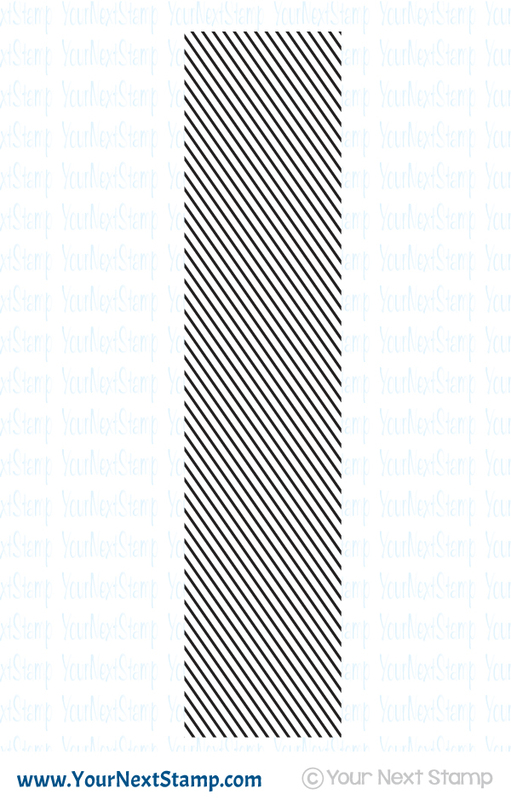 This is a perfect theme with all the fun stripe edge stamps that have been released the last 2 times. For my card, I am using the new set of Little Notes against the newly released stamp of Diagonal Stripe-tastic Edge. Using the EP collection of Pretty Girl for the back panel, I stamped the Diagonal Stripe-tastic Edge on the white top panel and added a small strip of patterned paper across the top of that. Using the coordinating Little Notes die set, I cut out the "paper" to stamp the sentiment onto and popped it up over the edge. I left out the word note in the sentiment to be replaced by the die word I cut out. The card was completed with the sun and flower from the set for an accent and some new Magical Pastel gumdrops. Be sure to stop by the YNS Blog to see all the stripe-tastic creations made by the DT and leave a comment for your chance to win a stamp set of your choice! Thanks so much for stopping by and have a great Wednesday! Are you ready for some cuteness and a fabulous release once again? The wait is over, your list is made, and now you can hop along to have a chance at winning a $25 gift certificate to the YNS Store! To top that off, there is an awesome deal Karen has put together to sweeten the deal of purchasing this new release. 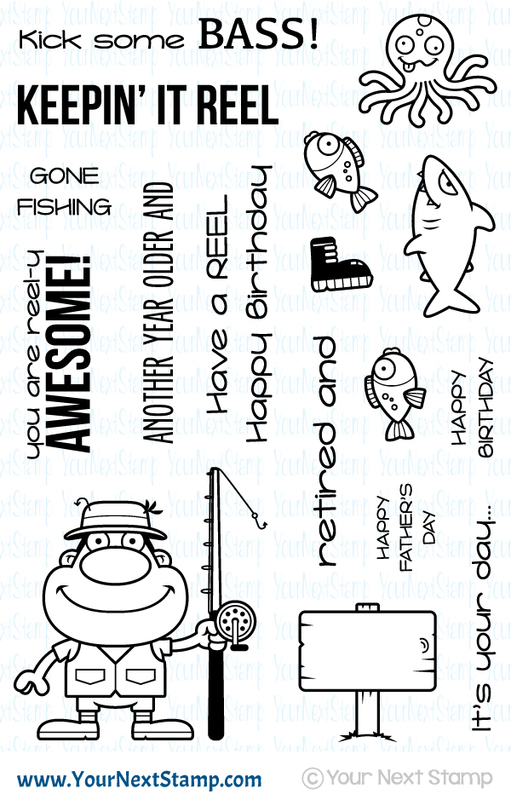 For my first card, I am using the new set called Keepin' it Reel. 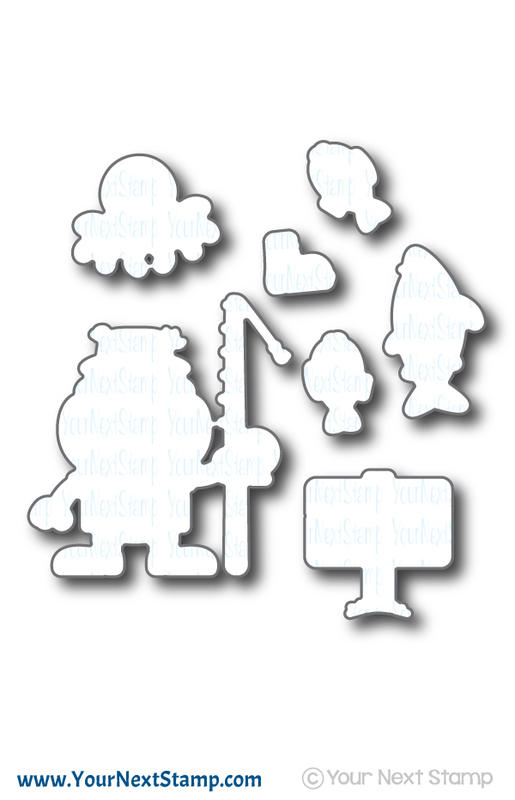 Is this just not the perfect set for your fisherman? 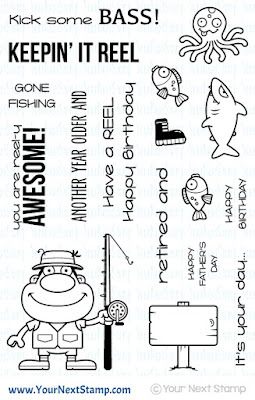 I know for me, my FIL will love this and I can see many more cards made with this set for not only him, but even my kids who love to fish. I create a bit of a scene for this and made it as if his boat came ashore and he is posing with his catch. The boat is hand cut and the sky is done using my Copic airbrush system. The sun is from another new set called Little Notes which I previewed yesterday. The grass is cut using the Chunky Grass die while the images are popped up. 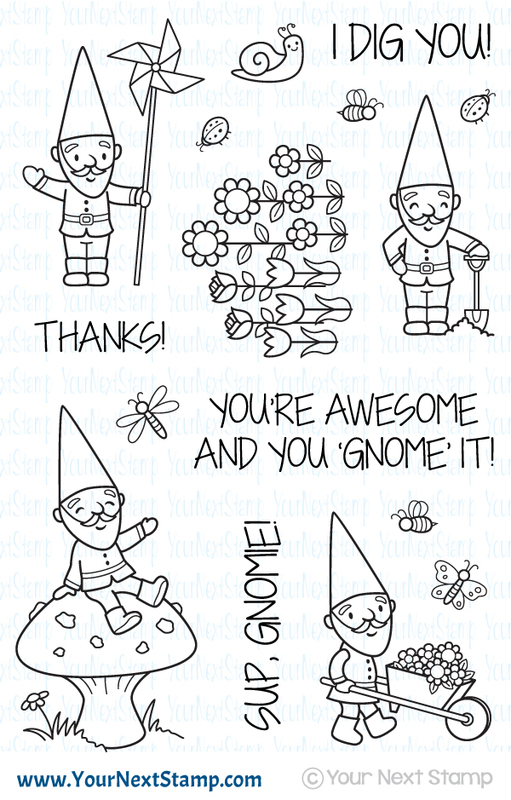 For my second card, I am using the new set called Cute Gnomies. This set just made me laugh and I loved making this card with the sentiment I chose. How adorable is this set? I love gnomes so I was pretty excited to have this set. The sentiments are perfect and I just know I will be using this set for many friends. I created it using some patterned paper from Theresa Collins and cut out the image with the YNS stitched oval die set before coloring him in with Copics. I also used the new stamp called Stripe-tastic diagonal edge for the center panel going across. The sentiment was stamped directly onto the striped strip and finished with some fun new gumdrops! Now I mentioned a sweet deal Karen has put together for your shopping ease. How about 20% your entire order?! Don't wait so you can ensure you will get all the sets you have your eye on.